Please answer the following questions so that you can decide if you want to invest the next few minutes to read this article. 1. How important is clarity in messaging your value proposition? 2. 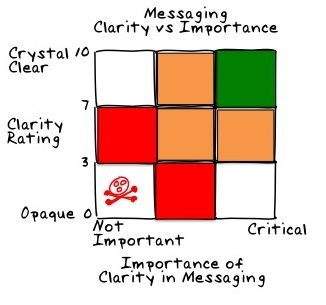 How would you rate the clarity of your message on a scale of 1-10, where 1 is "opaque" and 10 is "crystal clear"? If your answer to question 1. is extremely important and the answer to question 2. is better than 7/10 you are in a fairly exclusive club and may be familiar with many of the concepts in this article. This is where we encounter most opportunity; sales and marketing leaders recognize the importance of clarity in their Website messaging to drive inbound leads and high value sales conversations; and that there is room for improvement and they want to do something about it. I have met and worked with marketers in the red zone. They recognize that messaging is important and that they have a lot of work to do...or they are mistaken about the relative importance of clarity in their message and need to be shown how an improvement in messaging clarity can impact their business. I would expect to encounter very few marketers in the white zones; they view their message as unimportant, but crystal clear; or that it's super-important and completely vague. If the latter describes you then please request a messaging assessment and we can discuss an approach to urgently correct the situation. It's hard to imagine meeting a B2B marketer in the bottom left box. They have low expectations for their marketing messaging and have failed to achieve them. I met the CEO of an early stage company last week, who wanted outside help with branding; creating mission statements, articulating a vision and to position their new mobile product in the market. What I found unusual about their approach was that the team were not interested in connecting this positioning message to the daily conversations of salespeople...."this is something we'll worry about in future". Meanwhile the sales team will struggle to translate the output the new top-down message and PowerPoint presentation into daily sales conversations with prospects and the company will have failed to capitalize on a golden opportunity. This situation is prevalent in early stage companies and is one of the principal causes of death for emerging technology companies with killer products. 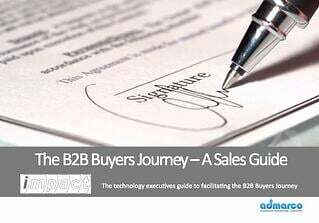 I have been involved in more than 40 B2B sales and marketing messaging projects to date that have varied from extremely complex, taking many weeks, involving multiple technologies, through to whiteboard storytelling where product value propositions are more focused and easier to derive. It seems obvious to me that sales and marketing should be using the same messaging and that everyone in the company is saying the same thing, whether in print or in person...that is why we have developed a bottom-up messaging methodology that starts with buyer needs and flows through the website to the conversations sales people have with clients. Must be built for purpose, based on buyer behavior, i.e. 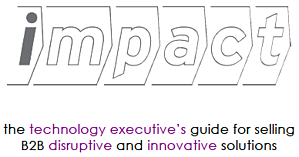 the Message required to support value-created (consultative) conversations is different to that of a value-offered (transactional) conversation. Must enhance sales productivity i.e. sales people will want to use the messaging until they have integrated it and use it unconsciously. Since this article was written, we have integrated the messaging alignment methodology to drive Website SEO and content creation and to enable salespeople to use the messaging in visual storytelling.